This conversion kit is designed for players who already own the Evolution, base game. 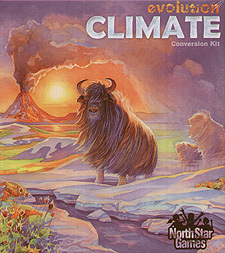 It contains everything needed to transform your base game into Evolution: Climate. In Evolution, your species must adapt to avoid starvation and fierce predators. Evolution: Climatecreates an additional challenge; the ever-changing climate. Give your species Heavy Fur to protect them against the bitter Ice Age, or give them Nocturnal to avoid the heat of the cruel desert sun. With amazing new traits and extraordinary new challenges, this conversion kit makes Evolution more diverse, more strategic, and more rewarding.